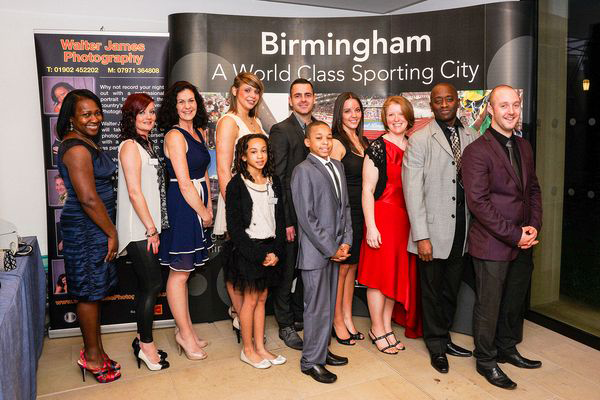 Bramall Music Building, University of Birmingham, was the setting for the 32nd annual Birmingham Sports Awards Evening. The purpose of the evening was to celebrate outstanding sporting achievements during 2012. Praise, thanks and awards were given for all the commitment, hard work, dedication and amazing achievements of clubs, coaches, volunteers and athletes involved in sport in Birmingham. Thirteen award categories were available for nomination, each one was whittled down to three finalists each of whom were then invited along to the awards event. 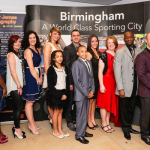 The City of Birmingham Gymnastics Club was shortlisted for three of the categories: ‘Young sportsperson of the year’ (Joe Fraser); ‘Performance Coach of the year’ (Lee Woolls); ‘Club in the Club of the year’ City of Birmingham Gymnastics Club. Excellent Hosting from BBC West Midlands Radio presenter, Pete Morgan, kept the ceremony flowing. 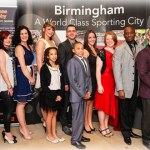 Sporting CV’s of clubs, individuals, organisers and Volunteers were read out and demonstrated the wealth of Club, national & International sporting talent emanating from Birmingham. Sports such as Gymnastics, Swimming, Athletics, Cricket, Netball to name but a few. Swimming and Athletics took deserved awards in the categories in which we were shortlisted and it was an honor to be in the same company as many who had similarly achieved at the highest level. A big thank you to the Birmingham Sports Awards Association for our final nomination and for an excellent evening in a prestigious venue alongside Birmingham’s sporting best. A final Well done also to the City of Birmingham Gymnastics Club for an excellent competitive record of achievements in 2012.